A new science and technology series on CNN International, ‘Make, Create, Innovate’tells the stories behind the inventions and technological breakthroughs that re-shape our world – a celebration of human ingenuity and the inquisitive mind. The series launches on Thursday, 27 September,as a fortnightly segment (every other Thursday) within ‘Quest Means Business’, CNN International’s prime time business show which airs at 1900 BST / 2000 CET. Presented by Nick Glass and filmed on location, each episode of ‘Make, Create, Innovate’ showcases the pioneers who have revolutionised the field in which they work. 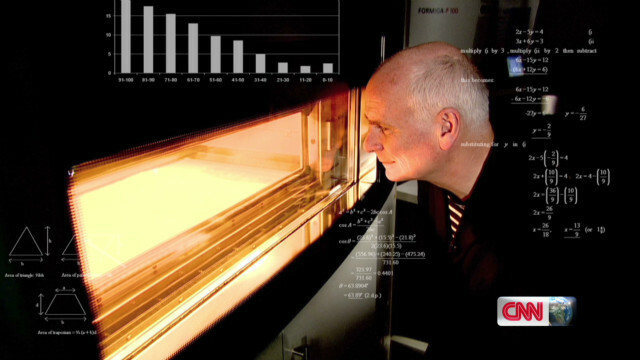 Each segment explores the origin of their ‘eureka’ moment, whether the result of a happy coincidence or years of trial and error experimentation; it also reveals the key economic or social value of those inventions – a patented concept that has transformed an industrial sector or peoples’ lives. ‘Make, Create, Innovate’will include technologies in health, medicine, space exploration, meteorology, exploration, mobility (transport), architecture, agriculture, manufacturing, sport, telecommunications and energy. Kicking off the series on Thursday 27 September, ‘Make, Create, Innovate’ focuses on ‘Li-Fi’, an Edinburgh-based story about the WiFi of the future, which uses light waves and could be the next generation of wireless communication. The lights in people’s homes, traffic lights or the light on a Smartphone could all provide access to the internet at broadband speed…‘Make, Create, Innovate’ meets Professor Harald Haas, the inventor behind this breakthrough, bringing his ‘light bulb’ moment to life. The second episode, airing Thursday 11 October, comes from Budapest, and is the story about the inventor of the Rubik’s Cube, Erno Rubik.